The LG P880 Optimus 4X HD is an Android phone that features Ice Cream Sandwich v.4.0 running on a Quad-core 1.5 GHz Cortex-A9, ULP GeForce GPu and Nvidia Tegra 3 chipset. This android is sure to be quick in computing. 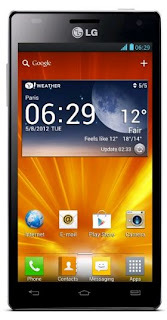 LG Optimus P880 has a large capacitive screen that measures 4.7 inches diagonally with a resolution of 3264 x 2448.